Joseph Ashcroft is, by his own assessment, a 'big beast'. He's gone missing along with £1.34 billion from the bank where he's a senior executive. Is he a modern-day Robin Hood taking from the seriously rich to give to the poor, or another corporate player who gone rogue? What he is, is a man with secrets, one of which from his days as a young army officer in Bosnia he shares with Ben Lancaster; the bank security chief tasked with tracking him down. Secrets, he soon learns are things you can run from, but never escape. Secrets are like shadows, for where you go -they follow. 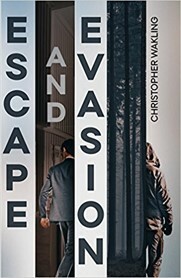 This novel uses the well- established trope of the fugitive driven out into the wilds, or what passes for them in the Home Counties, to tell the story of a man slowly dismantling himself. The life he has spent two decades constructing proves to be frighteningly fragile. Ashcroft is a fugitive from himself as much as the bank authorities, the ultimate unreliable narrator finding ever more elaborately improbable explanations for his predicament. Haunted by memories and regrets that are more persistent than a pack of bloodhounds, he literally goes to ground. What Wakling is examining is the male-ego - a peculiar mix of unacknowledged insecurities and a determination never to turn back once a direction of travel has been chosen; and the link to truth. This is an original take on the age-old story of a man who has everything but the truth is that he seeks, is in fact redemption.